Coming from Detroit, Chantel will be here for a brief visit and will not be available for private readings on this tour. Registration is required for this event. Her gallery readings will be free and by lottery-only. If your ticket is chosen you will receive a free 10-15 minute Angel Oracle reading from her!!! Sounds exciting!! Her books will be on sale and she will be available for signing after the event! Come on time!! Chantel Lysette is an angel intuitive and is an international author that has appeared on international radio and television. All three of her books, Azrael Loves Chocolate, Michael’s a Jock, The Angel Code, and Angelic Pathways are international and have been reprinted in several languages. Her latest book, Angelic Pathways, was released in July 2013 and is enjoying great success. A professional angelologist and cosmologist, known for being “sassy and irreverent”, Chantel Lysette has been connecting with the Divine Realm of Spirit her entire life. 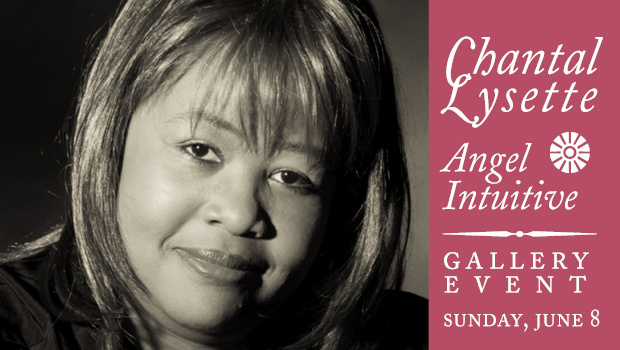 For two decades, she has shared her inspiring life story with multitudes, relaying her life’s triumphs and tragedies as a woman struck by a life-crushing crisis only to rise up again after surrendering to the Divine Realm of Spirit. Her story is one of compassion and redemption. And through her experience and example, she establishes a unique and profound connection with her clients, giving them a distinctive, yet down-to-earth perspective on spirituality. Lysette completed her first West Coast lecture tour in February and is now gearing up to return to Los Angeles in August for’ K-Con, a groundbreaking convention, which features South Korea’s upcoming, as well as, most popular music and film artists. There, she will be representing the Korean pop group, U-KISS (Ubiquitous Korean International Idol Superstars), and offering angelic consultations for charity on behalf of the music group. Never one to waste an opportunity to reach out to her fan base, Lysette also has plans for lectures and meet and greets while in the Los Angeles area during the week of the convention.